Given all the technology innovation in HVAC over the past few years, facility managers have a range of new options to consider. Evaluating those products means looking broadly at their impact on the organization. That broader look should start with basic economic questions like budget and ROI. That challenge isn’t limited to hospitals. In any organization, physical assets compete with other possible investments for organizational dollars. In healthcare, for example, competition for capital may include diagnostic or surgical equipment. “I have to make a case that a facility capital project is going to help achieve the organization’s mission,” says Taylor. 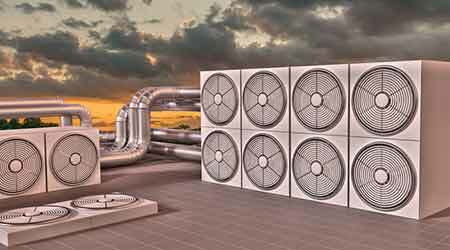 One obvious way HVAC equipment can do that is by reducing energy use. Energy efficient equipment can also reduce a facility’s carbon footprint, a growing concern for many hospitals and other organizations. At the same time, of course, new HVAC systems can reduce energy costs. And those savings drop to the bottom line. It’s also important to consider maintenance costs, says Michael McArdle, an HVAC engineer with buildings and grounds services for the State of Vermont. One factor to weigh is whether maintenance is performed by in-house staff or by contractors. Either way, maintenance costs are important, but in the latter case a reduction in maintenance also reduces spending. McArdle works with operating staff in designing HVAC systems to ensure that they will be maintenance friendly. “In this case, we’ve learned more from maintenance than the specifying architect,” he says. When it comes to new technologies, Taylor wants evidence that it has been well researched and accepted within the healthcare industry. “It’s a critical technology and not to be purchased lightly,” he says. But that doesn’t mean he’s not interested in what’s new. He looks for case studies as well as chances to speak with peers in healthcare who use the technology and can tell him how clinical staff has accepted the system and what results it has achieved. And he looks to broader industry discussions of the emerging technology. “As the industry starts to accept a technology, I like to follow the progression of that acceptance,” he says. The pay-off for that homework: being able to take advantage of advances in technology while avoiding the risks of unproven systems.